This publication examines the risks associated with the release of excessive nitrogen into the environment (climate change, depletion of the ozone layer, air pollution, water pollution, loss of biodiversity, deterioration of soil quality). The report also examines the uncertainty associated with the ability of nitrogen to move from one ecosystem to another and cause "cascading effects". In addition to better management of nitrogen risks at the local level, there is a need to consider the global risks associated with the continued increase in nitrous oxide concentrations and to prevent excess nitrogen in all its forms by developing cost-effective strategies for all its sources. Other than the reduction of nitrogen pollution, this report provides guidance on the use of nitrogen policy instruments and how to ensure coherence with objectives such as food security, energy security and environmental objectives. Excess nitrogen pollutes air, soil and water, increases greenhouse gas emissions, and impacts biodiversity and ecosystem functioning. Environmental policy measures have been taken to reduce the impacts of nitrogen on ecosystems and human health. However, while OECD nitrogen emissions have been reduced, the concentrations of nitrogen forms in air, soil and water still remain much too high overall. We need better mapping and understanding of the link between sources, pathways and impacts of nitrogen, that is impact-pathway analysis. Governments also need to establish national nitrogen budgets to make sure that policies to address local and global nitrogen impacts are reducing the overall quantities of excess nitrogen being released into the environment at the national level. 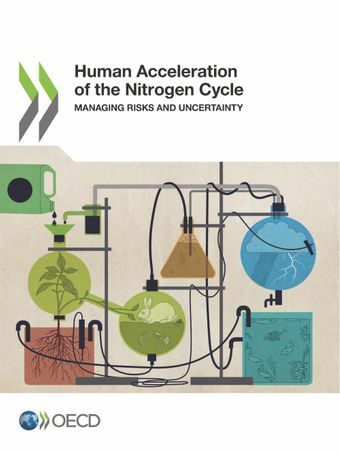 Watch this video to learn more about the policy approaches to managing the risks and uncertainty of disrupting the nitrogen cycle. Excess nitrogen pollutes air, soil and water, increases greenhouse gas emissions, and impacts biodiversity and ecosystem functioning. Environmental policy measures have been taken to reduce the impacts of nitrogen on ecosystems and human health. However, while OECD nitrogen emissions have been reduced, the concentrations of nitrogen forms in air, soil and water still remain much too high overall. Watch this video to learn more about the impacts of excess nitrogen on the environment, our health and the economy. For more information, please contact Gérard Bonnis of the OECD Environment Directorate.